Times have changed to an extent that laptops are no longer considered portable, as the new innovative tablets have taken over their place in all areas of functionality. The iPad especially has secured a niche market and is now found everywhere enabling people to perform all their tasks very easily with their fingertips. It has indeed replaced newspapers, books as well as all forms of documents and taken over the digital world market completely. Reading anything on the iPad is definitely a pleasure. All of us literally stuff our iPads with numerous ebooks and PDFs. 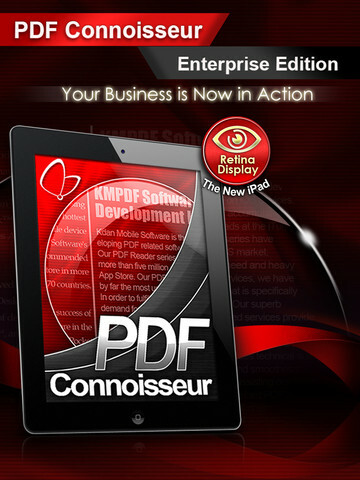 The PDF Connoisseur, developed by Kdan Mobile is a recent app that has taken reading PDFs on the iPad to another level. 1. It lets you open and read any format of file. It supports ZIP and RAR formats. The Connoisseur reads and saves files to PDF, a feature that is extremely handy when you receive a document on your iPad and need to do instant conversion. 2. You can protect specific files and folders with a secure password. 3. 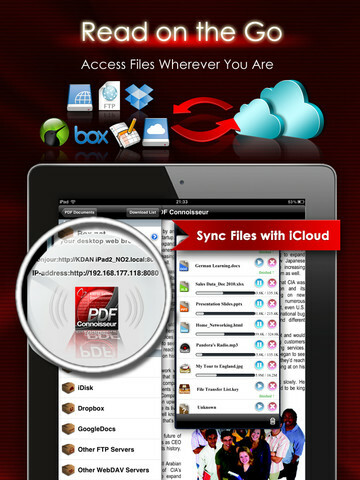 It enables to convert files into PDFs for editing. 4. The PDF Connoisseur can be synchronized with Dropbox, iDisk, GoogleDocs, Box.net, WebDav server and FTP for importing various files from different locations. It also enables importing files via Wi Fi. 5. 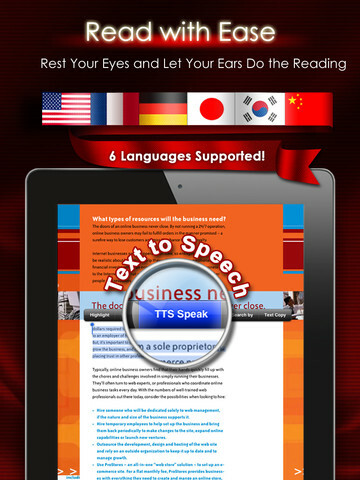 The most attractive feature on this app is that it has a text-to-speech (TTS) ability that enables it to read your documents to you. It is tri-lingual (French, English and German). 6. The PDF Connoisseur opens big documents at very high speed. 7. The app also can be used to draw and create notes, shapes on various documents, thereby arming people with tremendous working power in a mobile work environment. 8. The Connoisseur has an interface that is very easy and simple to use and navigate through. With such exclusive features, the functionality of the app is extremely high and is well received by people. But there are a few lags such as lack of a PDF scanner and some issues with the WiFi connectivity of the app. Even though the iPad has WiFi connection, the app at sometimes had problems with file transfers. But these issues are expected to be resolved by Kdan Mobile in their future versions. 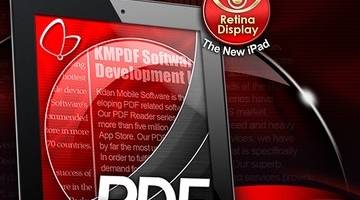 The app is offered at $6.99, almost two times the price of all other apps from Kdan Mobile. 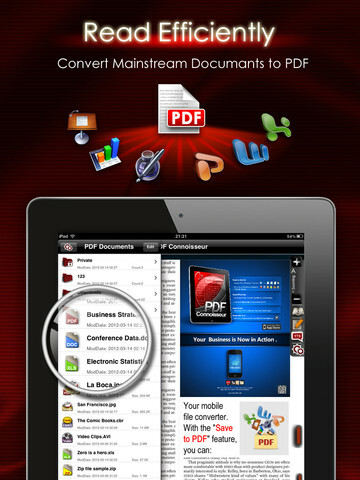 The PDF Connoisseur shares similar functionality with other leading file manager and reader apps for the iPad, the application stands out in terms of its speech to text conversion abilities and the option ti save different files to PDF. For people whose jobs are data intensive and there is a need for such an application which provides a less cumbersome way to read documents, the PDF Connoisseur is definitely a good buy!